Brent Waller, the Lego fan who built a Ghostbusters set that the toymaker eventually put into production, is back with a perfect recreation of the X-Files’ Mulder and Scully that includes a detailed miniature version of Fox’s cluttered FBI office. Believe it or not it’s been about 13 years since the final episode of the X-Files aired, but with the series being revived for a short run in the new year, now is as good a time as any for Lego to put Waller’s latest creation into production. 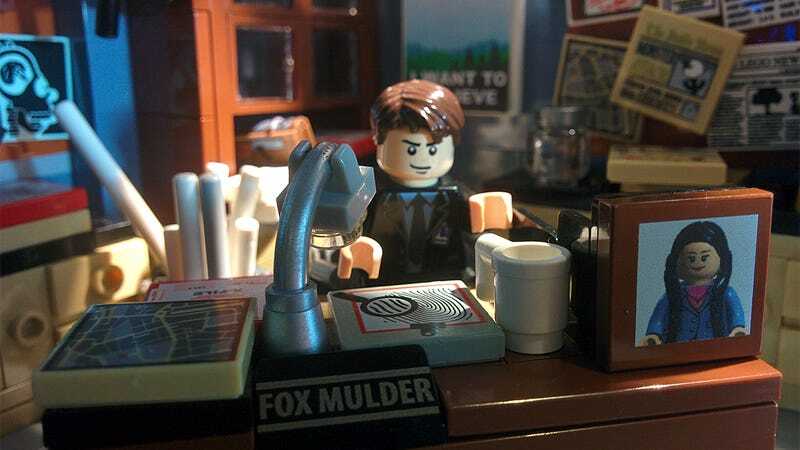 We’d even be happy just to get a Lego version of Mulder’s iconic “I want to believe” poster, but there isn’t an X-Files fan out there who also wouldn’t spend a small fortune for a miniature version of Fox’s office. Let’s get this on the Lego Ideas site ASAP. Update: Brent Waller reached out to us to let us know that he submitted his X-Files set to Lego Ideas, but it was unfortunately rejected due to the mature themes of the TV show. Sure, there was that one episode they rarely aired in re-runs, but it wasn’t that scary, right?